Cardiovascular disease, together with other diseases of lipid metabolism, remains the number one cause of health problems and mortality. Although much is known about the metabolism and transport of lipoproteins and lipids by cells from the biochemical and cell biology standpoint, the molecular details and mechanisms by which these physiological processes take place remain poorly understood. A detailed structural description of the plasma lipoproteins, their constituent apolipoproteins, and their receptors is crucial to understanding the molecular mechanisms involved in the physiology of lipoprotein metabolism and the pathophysiology of atherosclerosis and other diseases of lipid metabolism. The long-term objectives of our research are to determine this molecular detail and to understand the structure-function relationships underlying these processes. ApoA-I, the major protein of HDL, plays important roles in reverse cholesterol transport. Interaction with the ABCA1 transporter removes cholesterol from the cell membrane forming the nascent HDL particle. Activation of LCAT by apoA-I results in cholesterol esterification, and the transformation to the mature HDL particle. Finally, apoA-I is a ligand for the hepatic SR-B1 receptor through which cholesterol is delivered to the liver. We are building on our recent advance in understanding of the molecular structure of C-terminal truncated apoA-I to provide a mechanistic understanding of the molecular features of apoA-I crucial to understanding the mechanisms of lipid interaction, LCAT binding and activation, and HDL formation and function at a molecular level. These studies will use mutations designed through our new structural knowledge of apoA-I. In more long term studies we are developing a detailed molecular understanding of the cell surface transporter ABCA1 and its concerted action with apoA-I to remove cholesterol from cells. The molecular details of the specific interaction of apoA-I with ABCA1 remain unclear and the structural details that will provide a molecular description of how ABCA1 functions to translocate lipids across the cell membrane are unknown. Our structural studies will provide this critical knowledge of the molecular details and interactions of the crucial players in reverse cholesterol transport and metabolism that will drive our ability to develop molecularly based strategies to prevent or control dyslipoproteinemias and diseases of lipid metabolism. An additional focus concerns determination of the three-dimensional structure of intact LDL by cryo-electron microscopy and 3D-image reconstruction, with emphasis on the topology and the molecular conformation of the apo-B, protein component of LDL, at the lipoprotein surface. Our primary approaches use the techniques of modern molecular biophysics and structural biology. These include protein crystallography, structural electron microscopy/image processing, calorimetry/thermodynamics, circular dichroism, and molecular modeling/mechanics to probe the structure and physical properties of lipoproteins, apolipoproteins, peptide models for the apolipoproteins, and lipid/apolipoprotein reassembled model systems. The sequences of the exchangeable apolipoproteins are comprised of tandem internally homologous 11/22 residue repeats that can be divided into two 11-mer sub-repeats (A and B), with N-terminal Pro located in the A-repeat . The 11/22-mer repeats form amphipathic α-helices that are highly suited for an interfacial location at the lipoprotein surface. A refined consensus sequence representing an idealized version of this 11/22-mer (A/B) unit was derived in an analysis of the inter/intra-sequence homologies of apoA-I apoE, apoA-IV. 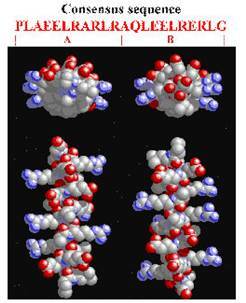 Molecular modeling showed that this 22-residue AB unit would form an idealized amphipathic α-helix. • Nolte R.T. and D. Atkinson. 1992. Conformational analysis of apolipoproteins A-I and E-3 based on primary sequence and circular dichroism. Biophys. J. 63:1221-1239. We have demonstrated that lipid-free apoA-I and apoA-II have a folded state in solution similar to the “molten globular” state described as an intermediate in the folding pathway of many water soluble proteins. Studies of the structure and stabilizing interactions of deletion and substitution mutations of apoA-1 investigate the features responsible for conformational stability and lipid interaction. Structural and thermodynamic studies of these mutant forms of apoA-I probe the role of specific regions of the apoA-I molecule in its conformation and stability. • Fang Y, Gursky O, Atkinson D. Structural studies of N- and C-terminally truncated human apolipoprotein A-I. Biochemistry. 2003 42(22):6881-90. • Gorshkova IN, Liu T, Kan HY, Chroni A, Zannis VI, Atkinson D. Structure and stability of apolipoprotein a-I in solution and in discoidal high-density lipoproteinprobed by double charge ablation and deletion mutation. Biochemistry. 2006 Jan 31;45(4):1242-54. To understand the properties of the individual segments of apoA-1, peptides are designed based on both the 11/22 residue amphipathic helical segments of apoA-I and on the “idealized” consensus sequence (CSP) for the fundamental 11/22-mer tandem repeat in the sequence of the apoproteins. 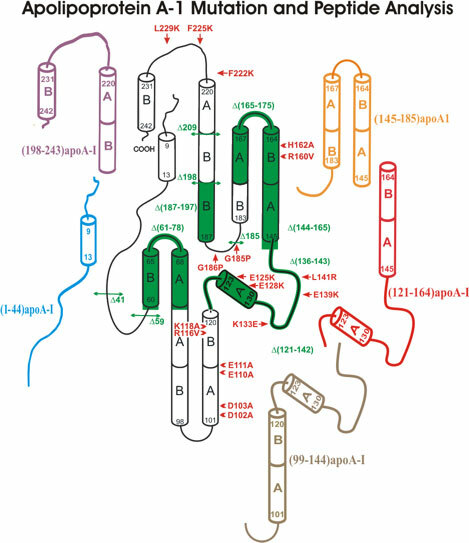 These include 44 amino acid peptides that overlap by one 22 amino acid repeat, apoA-I[99-142] (putative helices 4 and 5) and apoA-I[121-163] (putative helices 5 and 6), a peptide that models the N-terminal region (apoA-I[1-44]), and the peptide representing the C-terminus, apoA-I[198-243]. The conformation and stability of these peptides are studied using CD in solution, lipid mimicking detergents, and structure inducing solvents. 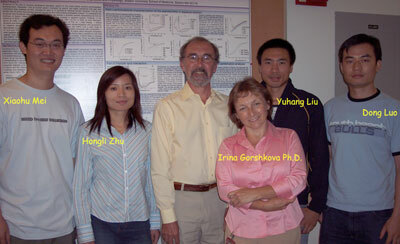 Their lipid binding properties are analyzed using electron microscopy and density gradient ultracentrifugation. • H. L. Zhu and D. Atkinson. Conformation and Lipid Binding of the N-Terminal (1-44) Domain of Human Apolipoprotein A-I. Biochemistry; 2004; 43(41) pp 13156 – 13164. • Xuan Gao, Shobini Jayaraman, Jeremy Wally, Madhumita Guha, Mengxiao Lu, David Atkinson, and Olga Gursky* Application of Circular Dichroism to Lipoproteins: Structure, Stability and Remodeling of Good and Bad Cholesterol. Circular Dichroism: Theory and Spectroscopy. Editor: David S. Rodgers, pp. ISBN 978-1-61122-522-8 © 2011 Nova Science Publishers, Inc. The structure of 44 amino acid consensus sequence peptides (CSP) that model this fundamental structural motif are studied by crystallography, NMR and dynamic simulation. Determination of the structure of 44-residue peptides with different juxtapositions of the consensus “A” and “B” repeats (e. g., BABA, BBAB), examines the role of Pro punctuation and inter-helical interactions. Comparison of the structures with those of the overlapping 44-residue “real sequence peptides” provides important information on the role of specific residues and their interactions in the structure and stability of the parent apoA-1. We have recently solved the 2.2Å crystal structure of C-terminal truncated D(185-243)apoA-I (PDB: 3R2P). The structure substantiates many features of the secondary structure predictions of the type A and type B helical repeats with different homologies and conformational details consistent with our mutation analysis. The crystal structure of D(185-243)apoA-I shows that it forms a half circle dimer. The backbone of the dimer consists of two elongated antiparallel proline-kinked helices (5 AB tandem repeats). The N-terminal domain of each molecule forms a four-helix bundle with the helical C-terminal region of the symmetry related partner. The structure also shows the molecular details of the stabilization of lipid-free apoA-I by the N-terminal exon-3 encoded residues and suggests the role of dimerization in the assembly of HDL. In addition, the structure suggests how the central domain may function as hinge region to facilitate a monomer to dimer conversion. With a semicircular backbone formed from antiparallel helical repeats, the structure allows us to model the formation of discoidal HDL particles with different geometries. The central domain may form a tunnel to translocate lipid during the interaction with LCAT. Finally, the structure provides molecular details that may underlie the structural and functional effects of apoA-I mutations such as Milano, Paris and Fin. To map unequivocally the protein surface of LDL, we preferentially labeled apoB with mono-sulfo-NHS-undecagold. The additional density in the reconstruction of the labeled LDL demonstrated that the spatial organization of apoB can be inferred from the high density distribution. We derived a 22Å resolution 3D density map of LDL, which showed a backbone of high-density regions that encircle the LDL particle. Additional high-density belts complemented this backbone to enclose the edge of the LDL particle. Image reconstruction of monoclonal antibody labeled LDL located six epitopes in five putative domains of apoB. Epitopes in the LDL receptor-binding domain were located on one side of the LDL particle, and epitopes in the N-terminal and C-terminal domains of apoB were in close vicinity at the front side of the particle. The images reveal a looped topology of apoB on the LDL surface and demonstrate the active role of apoB in maintaining the shape of the LDL particle. Images of both mAb-labeled and unlabeled LDL clearly showed an intrinsic pointed feature representing the N-terminal domain of apoB. The epitope location for 5E11 (and for Mb47) that corresponds to the LDL receptor-binding site suggests that the receptor-binding site is at the side of the LDL particle. In the lipid core, the cholesterol ester undergoes an order-disorder phase transition as temperature increases, as first described by us 35 years ago. The structure cryo-preserved from 20oC shows the flat layered density distribution in the particle core, identified by us and others, arising from the packing of the lipids. We have now obtained a reliable reconstruction of the LDL particle above the phase transition that clearly shows the change in core organization and most importantly a significant change in LDL morphology. A complete list of my publications is included in my CV. Click here to download my CV. This graduate level course provides a thorough grounding in the theory and major experimental methods of Biophysics and Structural Biology. The course covers protein thermodynamics, spectroscopy, electron microscopy, x-ray diffraction, crystallography, and NMR. The course provides both didactic and laboratory instruction. This advanced course covers the concepts of the assembly of biomacromolecules, their structure and stabilizing forces, and biological function as related to structure. Examples are drawn from assemblies of proteins, lipids, lipoprotein systems, membranes and viruses. This course is designed to acquaint the student with the basic principles of modern biochemistry. The topics to be covered include proteins, enzymes, DNA, RNA and protein synthesis, metabolism, lipids, connective tissue, and hormones and second messengers. Integrated treatment of human endocrinology, biosynthesis of hormones, their receptor interactions, and their physiological effects. This course presents the physiology of cells, tissues, organs, and integrated body functions, including the physiological basis for the understanding of clinical conditions. An integrated approach is taken to endocrinology and reproduction. Hormonal aberrations and their end results in humans are presented in clinical correlations.